Cairo is a big, dirty, bustling, 24-hour city with a deep history and extraordinary traffic. But there is so much to see and understand it is definitely worth braving the traffic to explore it. We chose to spend 3 full days in and around the city because we wanted to explore not only Ancient Egypt but also the Islamic and Coptic history of the city of Cairo. We started with the Egyptian Museum to get a sense of the timeline of the history of the Ancient Egyptian civilization. The current museum is laid out in chronological order so you can explore the development of the art from 5000 years ago through the Old, Middle and New Kingdoms of Egypt until the Romans came. We had a guide, who I was grateful to, because so much of Egyptian history is told through the symbolism in carvings which I would not have understood without Hala at our side. With over 120,000 objects, the museum houses some of the earliest detailed carvings we have of a King ruling over his people, conquering his enemies and uniting Egypt. The fabulous treasure of Tutankhamun is a sumptuous feast of gold and fine art for the mind but much of the museum is not for my camera. Many of the pieces are behind glass, or photos are not allowed and the museum is over a hundred years old and not well presented. As my father, said it is like the British Museum in the 1950s. The good news is a new, modern museum is being completed and should open in 2018 and several pieces had already been moved across for restoration. We walked down Mui’z street one evening, starting at the old Cairo city walls and walking past old mosques from the Fatamid and Mamluk periods, as well as markets, shops and restaurants. There are the opaque windows of the harem, the schools for teaching the Koran, watering stops and even Gothic architectural elements from the Crusader period adopted and then designed into gates and windows and the old buildings that line the street. It has the feel of an old market street and a holy place. Along Mui’z street is the only remaining wakala in Cairo – the El-Ghuri Wakala. Beautiful in a haunting way, it was a place merchants could safely stay overnight as they traveled up from Africa. The purpose was on the same lines as the caravanserai I visited in Jordan, but this one is still a living building with dance and music events in the evenings; we saw a Dervish performance there. Wonderful music and a Sufi dancer who kept whirling for over 30 minutes as he developed his meditative trance but kept us riveted the whole time. This is a terrific place to shop. Everything from “antiques” such as 1950s phones and cameras to copper pots to spices. As usual, I bought spices. Art is on every surface! There are hundreds of pyramids west of the Nile but there are three sites close to Cairo with the most dramatic pyramids and burial sites you will ever see. We again explored in chronological order. We started at Saqqara, then Dahshur, then Giza. The burial sites at Saqqara are 4,750 years old and yet detailed, elegant and very moving. 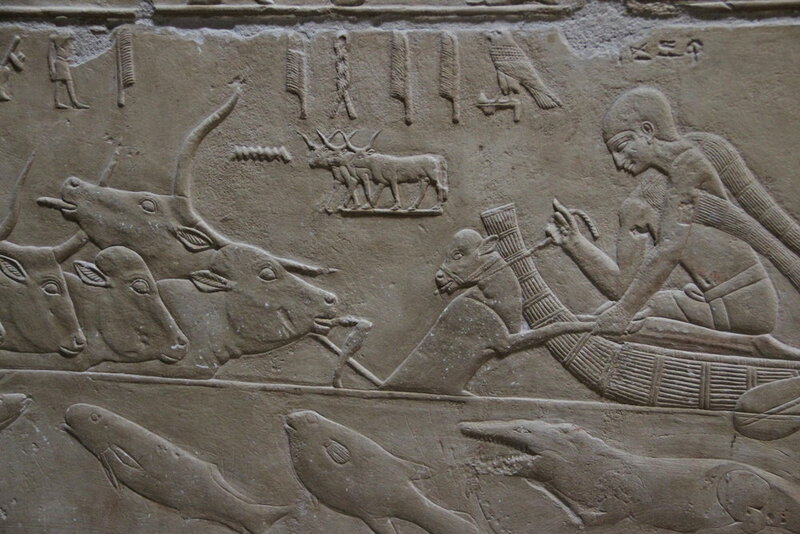 Unlike later Egyptian tombs, the Saqqara burial sites capture everyday life. Hunting, fishing, cooking, feasting and dancing. Hippos and crocodiles in the river, calves with their mothers, flocks of birds and even a farmer kissing his piglet. I felt that we were seeing a window into a wonderful, rich life that the King did not want to give up and so he was covering his tomb walls with the people and places he wanted to bring with him into his afterlife. The carving is so fine and evocative it is hard to believe it is as old as it is. I knew it, but felt viscerally that mankind has clearly had fine art much longer than I realized. Daily life - using a calf to lead her mother, and the rest of the herd across the river as a crocodile chases fish below. The paintings are so rich and detailed it was essential to have Hala, an egyptologist, explain them to us. Next up was the Step Pyramid of Djoser. This is thought to be one of the earliest monuments in the world with dressed stone. Then on to the Bent Pyramid at Dahshur which, given it was built in 2600BC is impressive in itself, but shows that the architects had not fully conquered the form yet. 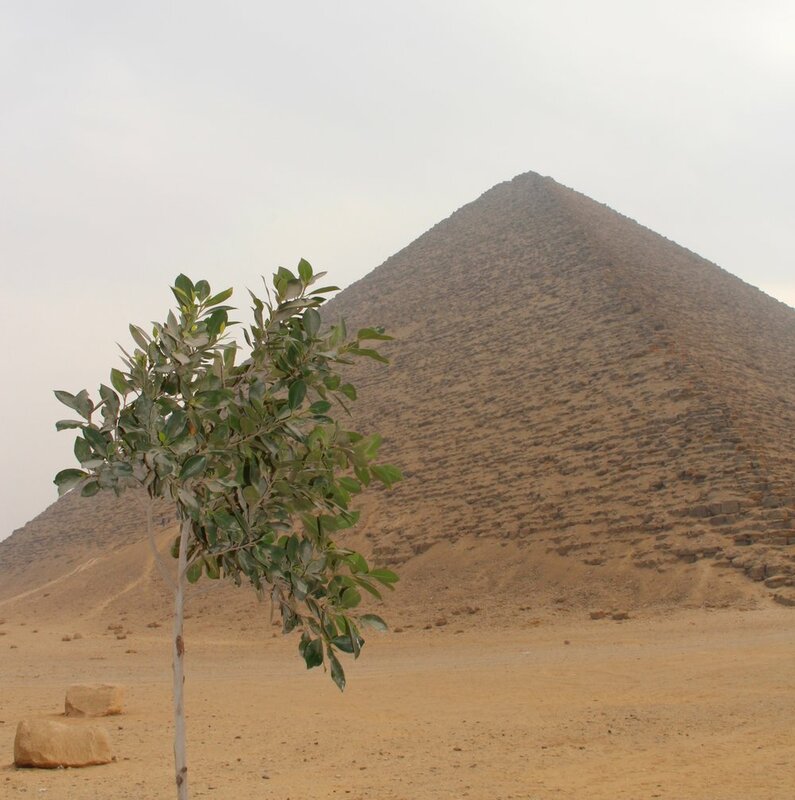 But just a short distance away is the first perfect pyramid, the Red Pyramid. Again, intimidating to stand beside and admire the mathematical skill of the builders. And even more fun for our group was that we could climb down inside to the original burial chamber; not for the claustrophobic! Our intrepid crew at the Bent Pyramid - which had not yet conquered the form! And then, at the Red Pyramid, a perfect pyramid. And, of course, we had to visit the large, perfect pyramids at Giza, although here was the only place in Cairo we saw lots of other tourists. Very few Americans, but we heard many European languages, saw large groups from Asia and many tourists from the Middle East. It’s only the Americans that are fearful it seems. We loved the boat museum at Giza. One of seven boats to be buried outside the pyramid for the King to use in the afterlife, this one was found in 1954 and had never been disturbed. After a painstakingly careful process the boat was reassembled and has its own museum. It’s large, beautifully crafted and stunning. Designed to carry the body of the King from his embalming to his burial in great state. Simply magnificent. Our final day was spent exploring Coptic churches and mosques. Christianity goes back to before the days of Constantine’s conversion here. It is believed the holy family stayed in a crypt for 3 months underneath a present day church and right under the nose of the Roman fort. Today the crypt has been drained (it was flooded until last year) and there is a beautiful, restored, mostly Medieval brick church above it. But for me the treat was the Hanging Church which is built into the Roman fortress known as the Fortress Babylon. Built by Trajan, it was four huge stone towers in a square fort. Now one tower is a ruin, one is a church and two contain the “hanging” church which is suspended halfway up their height. There is history of a church here since the fourth century and the current church dates from the seventh century. 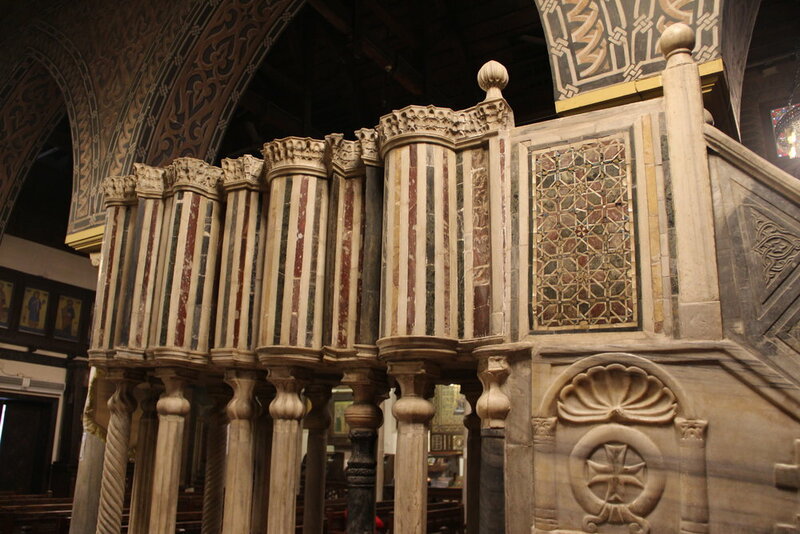 It’s dark, conventional orthodox in style and yet full of spoiliated columns and capitals from Roman ruins. And it was in the Coptic area that we saw the current politics at work. 10% of Egyptians are Coptic Christians and they are being targeted by Isis so each church has very heavy police presence around it. As we came to the Hanging Church our guide took us to the outside of the Roman towers containing the church which was down a side passage way. The guard on the passage (not a policeman) said it was OK but then as we came out a policeman came over and started arguing with our guide. She stood her ground, but he became very aggressive because the area we had gone to was not guarded. For the next three hours every policeman we saw argued with her and told her to go and see the chief – to which she said she was busy. Eventually he found her and took down her license number etc. as they had an intense argument. I gather the police had seriously inflated power under Mubarak, they were taken down by Morsi and are now gathering strength again under Sisi. This was one of the times we knew we were in a country under military rule. There are two magnificent mosques together in Cairo – one built in the Mamluk time, one late 19th century, both huge and imposing. It was sad to see that they are not maintained and very dirty, but through the dirt have gorgeous inlay and carved Islamic art on the walls. The only clean part of the more modern mosque was the tomb of the Shah of Iran which is pristine. And it’s ironic that he is buried with more flash than the Egyptian royal family. Otherwise, apart from an obvious police and army presence at important sites and road junctions we felt as if we were simply in a safe, but busy, Egyptian city with clean, luxury hotels, welcoming people and delicious food. I have to hope the Egyptians win over the terrorists in the North Sinai (who are funded by Hamas in Gaza and by Qatar) and the tourists come back for the sake of the many people whose livelihood has been lost since the revolution of 2011. Our trip was planned by Indagare.com who worked with Nubia Tours on the ground. Definitely the way to go!